Surprised members of a cyclone-hit community in Zimbabwe paused from retrieving and burying their dead to welcome the first humanitarian aid from the outside world as it arrived nearly two weeks after the storm. 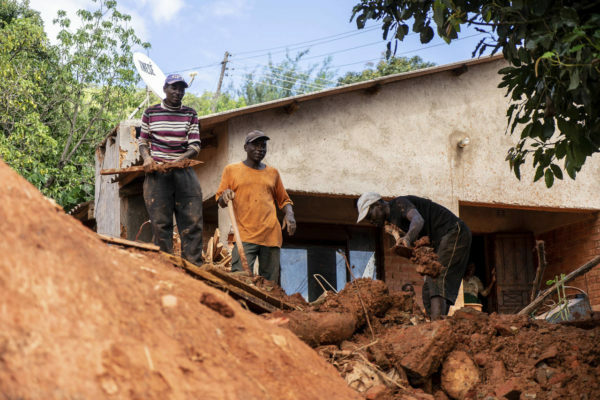 Survivors in Machongwe village rushed for aid this week, 12 days after the cyclone hit, putting aside a search that is now less about finding survivors and more about properly burying bodies. The village’s commercial center was entirely swept away. 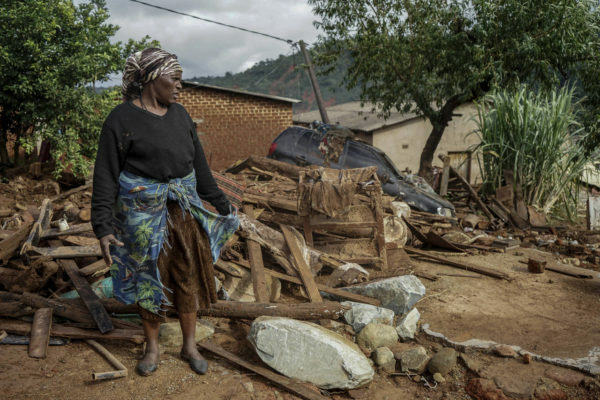 The village is one of many in Zimbabwe and Mozambique cut off since Cyclone Idai made landfall on March 14, swamping huge areas of central Mozambique and sending boulders crashing down mountainsides in Zimbabwe. As search and relief efforts continue, no one knows how many people are missing, or dead. “This is the first time we are getting some help,” said Justin Sungura. The 18-year-old wore a dirty replica jersey of British football club Manchester City, oversized formal trousers and worn-out cleats – the only clothing he had left. Lucy Chidawu, a 34-year-old mother of five, held dearly to her rations while soldiers tried to restrain the shoving crowd. People received a small packet of dried fish, beans, cooking oil, salt and sugar – quantities that many people said were better than nothing. “It will only last a week at most. Hopefully the food will keep coming,” Chidawu said. Many hungry people had resorted to eating guava fruits and cooking unripe bananas, she said. Some people desperate for the aid crossed a nearby river on a makeshift bridge of wooden poles supported by stones. Residents marveled at how little of normal life remained. “We used to shop, drink and play snooker here. 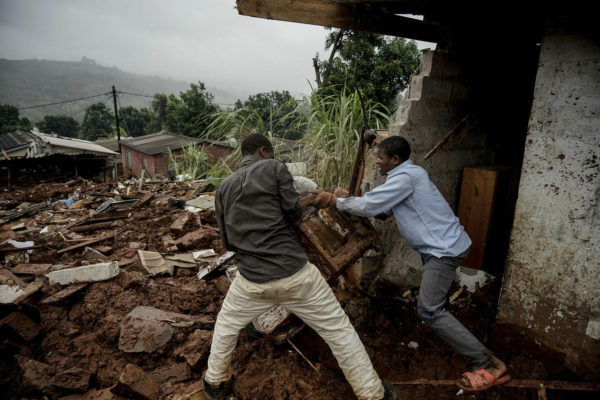 There were shops and houses, all swept away,” Hebert Mazungu said. The cyclone reshaped the landscape. Powerful waterfalls now rush down mountainsides that once had been forested with pine and eucalyptus trees. In some places only the roofs of homes protrude from the now boulder-strewn ground. In another hard-hit area, the stench of death led people to bodies covered by rocks and mud. In every direction, people were digging. A young boy worked solo, using a small shovel. He was looking for his father. Others dug with their bare hands. “We have found someone here,” a man shouted. It was the body of a young boy, wrapped in a blanket and buried by the mudslide. He must have been sleeping when the cyclone hit, people said. Residents asked soldiers to take the body away because they could not identify it. The corpse was carried away in a blue body bag, leaving the blanket in the mud. “This is a daily occurrence. We are finding bodies every day,” one woman said. The South African government is deploying sniffer dogs to help with the search efforts, the state-run Herald newspaper reported. Rudo Mukwada said five bodies were found under what used to be her garden. She recognized none of them as family. “They must have been washed down here from somewhere,” she said. She said the waters had carried her some 100 meters (109 yards) from her home. “It was as if I was flying in a plane, it was like a dream,” Mukwada said. UNICEF’s deputy regional director for eastern and southern Africa, Bo Viktor Nylund, visited some of the most affected areas in eastern Zimbabwe and said the children’s agency was appealing for $150 million for humanitarian aid for Zimbabwe, Malawi and Mozambique. The amount may increase “because some of the areas are still inaccessible,” he told reporters at a school that had become a camp for about 200 people left homeless by the storm. Different Zimbabwean government ministries and agencies have issued conflicting numbers of deaths. Residents said they had long stopped caring about the body count. Five cases of cholera have been confirmed in Mozambique following the cyclone that ravaged the country, killing at least 468 people, a government health official said on Wednesday. 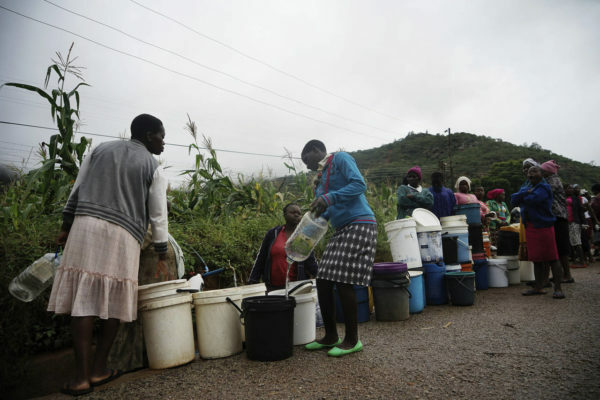 Cyclone Idai smashed into Mozambique on March 15, unleashing hurricane-force winds and heavy rains that flooded much of the centre of the country and then battered eastern Zimbabwe and Malawi. The Red Cross has previously warned of a "ticking bomb of disease" and called for the deployment of medicines and health professionals to avert a full-blown health disaster. "We have five cases of cholera which have been confirmed. This is in Beira and the area around," the health official, Ussein Isse, told journalists, referring to the city which bore the brunt of the cyclone's force. Cholera is a waterborne disease that thrives in conditions of poor hygiene and causes acute diarrhoea that can prove fatal if untreated. "We were expecting cholera cases and we were prepared for this. We have put all the measures in place to try to mitigate the spread of cholera as much as we can," said Emma Batey, a coordinator at the COSACA emergency aid consortium. Stagnant water, decomposing bodies and lack of sanitation in overcrowded shelters in Mozambique could create breeding grounds for typhus and malaria in addition to cholera, experts say. "There will be more cases because cholera is epidemic. When you have one case you can expect more. We are implementing preventive measures to limit the impact," added Isse. UN humanitarian aid chief Mark Lowcock has appealed for $282 million (250 million euros) of relief aid over the next three months for Mozambique. The UN's World Food Programme (WFP) said roughly 3,125 square kilometres (1,200 square miles) of land had been swamped. Nearly three million people across Mozambique, Malawi and Zimbabwe have been affected according to the WFP and 500,000 displaced. More than 700 people have been killed in Mozambique and Zimbabwe and hundreds are missing, according to an AFP toll compiled from figures provided by governments and UN agencies. The International Organisation for Migration has said that Cyclone Idai and its aftermath "could rank as the worst disaster to hit the region in decades". "In Beira city... they have five cases of malaria and 100 cases of diarrhoea. Soon we'll have more updates, but they are still receiving other (patients)," said Isse. "So they are taking precautions of isolating those who have diarrhoea... so it cannot spread." A long line of women in bright dresses waited under the baking sun in Estaquinha, 80 kilometres west of Beira, to receive emergency supplies from South African NGO Gift of the Givers Tuesday. Environment Minister Celso Correia said around 170,000 people were living in government relief camps but insisted that conditions were improving. "Most of them already have doctors there and clean water and other means of assistance. The situation is getting better," he said alongside Isse at the media briefing. "The biggest challenge remains bringing help to families." Roads made impassable by flood water and debris are gradually being unblocked.